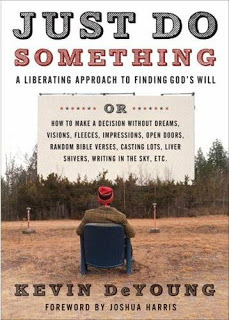 The title alone would seem to sum up its thesis: Just Do Something: How to Make a Decision Without Dreams, Visions, Fleeces, Open Doors, Random Bible Verses, Casting Lots, Liver Shivers, Writing in the Sky, etc. The intended audience was young adults, but as DeYoung described its purpose, it is relevant for any Christian. The gist of the book is that too many of us spend too much time trying to divine God's will and too little time striving to obey the plain commands of Scripture. God's will is not a corn maze or magic eight ball. His will is our sanctification. God promises to direct our steps all throughout life, but he never promises to show us what each step is ahead of time. Too many of us are prone to passivity and indecision, because doing nothing feels more spiritual (and less risky) than doing something. So we stumble around in chains of subjective impressions and wander here and there and in and out of our parent's basement. God's will is not a bullseye to hit, but a life to live. I've since read that book and it reminded me of an older book that greatly influenced how I thought about discerning God's will for my life, Decision Making and the Will of God: A Biblical Alternative to the Traditional View  by Friesen and Maxson. The emphases are different. Friesen and Maxson are concerned with those who are burdened by the need for specific direction out of fear that they might be "out of God's will" for their lives. DeYoung, on the other hand, focuses on those who lack decisiveness and find safety in inaction—for whom not knowing God's specific will grants permission to do nothing. In those areas specifically addressed by the Bible, the revealed commands of God (His moral will) are to be obeyed. In those areas where the Bible gives no command or principle (nonmoral decisions), the believer is free and responsible to choose his own course of action. Any decision made within the moral will of God is acceptable to God. In nonmoral decisions, the objective of the Christian is to make wise decisions on the basis of spiritual expediency. In all decisions, the believer should humbly submit, in advance, to the outworking of God's sovereign will as it touches each decision. By "spiritual expediency" in point three, they mean wisdom, and say "The ultimate Source of the wisdom that is needed in decision making is God. Accordingly, we are to ask Him to provide what we lack. God mediates His wisdom to us through His Word, our personal research, wise counselors, and the applied lessons of life." Both Decision Making and Do Something seem to be saying that we should be about doing what we know is God's will—not agonizing over, or complacently waiting for, what we do not know. "...I will spue thee out of my mouth"
"We should not want the Bible to sound modern"
"The most interesting man in the (Bible) world"
"Underneath are the everlasting arms"
Murder as a "calming reprieve"